Five (5) Prizes per Week will be awarded in any combination of items including: a 1/64 Die Cast Car Approximate Retail Value (“ARV”): $7.99, a Racing Soft Sided Cooler ARV: $5.00, a “Fueled by Bacon” Magnet: ARV: $5.00 and a $10 Walmart eCard. 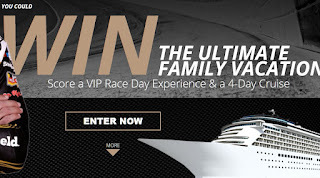 One (1) Grand Prize: a VIP Race Day Experience for four (4) people (winner and 3 guests) to attend a NASCAR Race on 11/17/19 at the Homestead-Miami Speedway and a post-race, 3-night/4-day Cruise Line Vacation (“Prize”). Prize includes: VIP Experience Tickets for the Ford EcoBoost 400 NASCAR® Race at Homestead-Miami Speedway on 11/17/19. Round trip, economy air transportation for winner and three (3) guests from a major gateway airport near winner’s home on 11/16/19 to Miami, FL with return flight to the same airport as departure on 11/23/19, 4 nights hotel accommodation in Miami, FL (1 room, quad occupancy), rental car for 4 nights/3 days (eligible drivers only; excludes collision damage waiver, insurance, fuel & parking and is subject to rental car terms and conditions), 3 nights/4 days family cabin accommodations while on the cruise ship, standard meal plan, airport transfer from cruise ship port to Miami airport on 11/23/19 and air & cruise taxes. Any additional expenses, including, but not limited to adult beverages, upgraded dining options, cruise excursions, gratuities and incidental expenses are the sole responsibility of Prize winner. Travel arrangements are based on availability; additional black-out dates and restrictions may apply. All travel must be completed by 11/23/19. ARV: $8,000.00.